Photocopies, watercolor, acrylic, polyurethane, sesame seeds, brass tacks on cardboard mounted on stretcher strips. 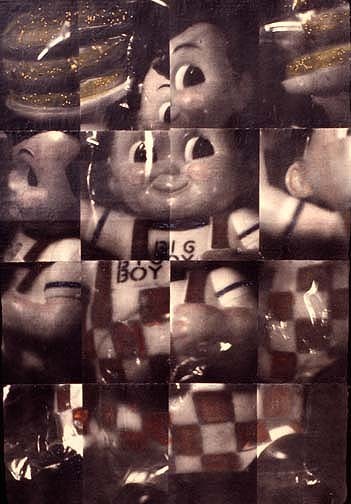 "This threatening-looking piece is made from close-up images of a promotional item that Bob's Big Boy restaurant sent to The Philadelphia Inquirer. I glued sesame seeds to the burger for an authentic mouth-watering effect."